Every venture capital firm here in the Valley has its own approach to staying connected to entrepreneurs, early stage investors, and likely acquirers. Some teams throw lavish parties, some hold retreats with motivational speakers, others just woo folks with the old faithful dinner and wine routine. Thanks to Bill Tai and Saar Gur, Charles River Ventures has taken a very different approach: kite junkets. Bill started the tradition a few years ago when he invited a couple dozen folks from Silicon Valley to join him and a smattering of professional kitesurfers in Maui for a few days of riding perfect winds in warm water and geeking out about technology whenever the winds were light. The trip was an instant hit with folks of varying kitesurfing abilities making the trek to Maui and learning one of the more thrilling sports I have experienced. I was lucky enough to be invited last year and had an unqualified blast. This weekend, the CRV guys outdid themselves, however, as they invited a group of us to join them in Utah for a weekend of snowkiting. Yeah. 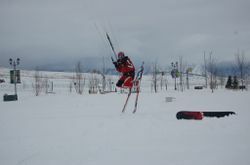 Kitesurfing on snow! We were buried in fascinating amounts of snow during the trip, making the entire venture difficult. Nevertheless, thanks to capable guides like the trio who kited Mavericks and the Farallons, Jeff Kafka, Chips Wasson, and Steve Gibson, we were soon being whipped around an 11,000 foot ridge outside of Mt. Pleasant, UT. Kiting on show is surreal as it is possible to travel in all four directions, including heading uphill! That said, the stakes are raised when jumping and crashing as hard ground tends not to be as forgiving as water. Ouch. I will skip over a detailed review of what transpires when two dozen adrenaline junkie nerds descend upon a quiet Mormon town's sole watering hole and encounter a one man band who we soon convert to a karaoke format. 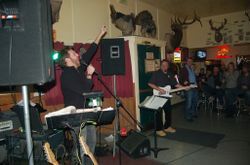 Let's just say that the power of rock was palpable. 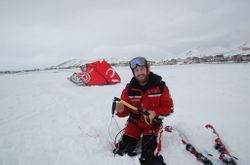 On Sunday, the snow came down even harder making kiting at high elevation impossible due to lack of visibility. Discouraged, we pulled stakes to head for some resort skiing in Little Cottonwood Canyon. Along the way up Interstate 15, Chip scoped out a large field just off the road in Draper, UT and thought it might be worth throwing up some kites. Far from the wonderfully isolated park in which we had kited the day before, let me be clear. This was a 10 acre field just off the road with a Cabela's superstore on one side and the neighborhood embodiment of the subprime mortgage crisis on the other. In fact, our field was probably intended to be "Phase 2" of the development before the financing dried up. Needless to say, kiting in suburbia was a hoot. Chip, Steve, P-Air Wolff, and I pumped up our kites and cheered as each of them took to the sky. Dozens of trucks (people in Utah don't drive cars, it seems) pulled over to make heads or tails of what these wahoos were doing. We ripped back and forth, popped airs, and laughed out loud for a couple of hours. Such a memorable day. To make it even better, Steve let me know he has officially named the spot "Subprimes." All told, I love new adventures and snowkiting was no exception. More than just the individual thrill, there is something so incredible about tackling fresh challenges with friends. On this trip, I made some great new pals and got closer to some old ones. Thanks again to Bill and Saar for putting this together and I look forward to seeing you all on the snow, or the water, soon. Here's a clip of the trip! Thanks for the tips Jeff! My cousins suggested the same thing, but I've yet to locate a FP in decent shape. Then again 200 RMB isn't all that much when converted to USD. Just don't want to start racking up bikes when one quality unit would do.